Today I bring to you a collection of the most powerful positive affirmations for happiness. I give this list to you as a way of helping you inspire yourself to go after, what I believe, is your absolute birthright. Something we are all seeking. But why are we seeking this? We’ll my theory that deeply resonates with me is that happiness is actually our true nature. Something we are all looking for as if it is so far away or elusive. But in actually it is closer than skin. It is our true essence. Something that comes so natural to us. But we have simply forgotten to express it and search for it in the correct way. So with this list, I hope we an affirm our way back to our true nature. And seek happiness from within. For the more we do so, the less pain we experience. 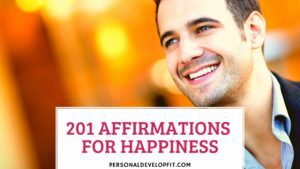 I hope this list of affirmations on happiness help you transcend your current state. And sink so deep into a state of pure happiness that you never want to leave. And don’t have to leave because YOU discovered the real truth. And like it is said, the truth shall set you free. This truth is the ultimate truth. Finding happiness is serious business. And I hope this list helps you finding truth and pure happiness in your life. I am perfectly happy and content in the here and now. The universe is conspiring with all of it’s ability to bring me complete happiness. I only draw into my life happy and positive people. I naturally gravitate to things and people that support my complete happiness and peace. I choose to by happy regardless of my circumstances. Happiness is my one of my top core values and all of my decisions are in align with bringing me to a complete place of happiness. I choose happiness over any other emotion each day. When I have feelings of unhappiness, I instantly choose to feel happy and content. I have complete control over my emotions, including my levels of happiness. Happiness feels so great because it is my true nature, and that is something I remind myself of daily. No one but be determines and dictates my level of happiness. I am fully responsible for my levels of happiness. I am happy with exactly who I am and accept myself fully and completely. I only keep positive and happy thoughts in my mind and allow nothing but these type of thoughts. I look at life with optimism and feel great energy each day. I am bathed with universal happiness and love. Wherever I am, I only sees smiles and happiness in the people around. My happy nature inspires people and transforms their moods, making me feel better too. The more I love, the more happy I become. That is why I choose to love each day. Optimism and happiness course through my veins. I ooze happiness throughout each and everyone of my pores. God wants me to be happy and supports me in my pursuit of it daily. I know that the more work I put into myself and seek self growth, the happier I become. That is why I grow myself daily. Happiness comes from within and not outside of me. I meditate and pray on happiness which brings me more of it and full contentment. I can’t but overflow with joy each day of my life. I love bringing other people happiness for I know that it makes me happier, a true win win. My levels of happiness and unlimited and that makes me smile. I love myself completely for this is what true happiness is. I act childlike in my life, in complete acceptance, curious about life and completely happy and energetic. Wherever I go, happiness follows. I look at life in a way that I only live once, so any moment not spent happy is time wasted. No matter what people say about me, I will always be happy and love myself. Happiness and love are major driving forces in my life. I know what I focus on expands, so that is why I only focus on happiness and love. I am completely ecstatic and joyful in all of my experiences. I easily eat the right foods and engage in strenuous workouts, which make me feel alive and healthy. Creating happiness in me because of it. Happiness is a word that I give definition to, not anyone else. Each morning I wake up, I give gratitude to the people I love, which makes me happy. I forgive others quickly and don’t hold grudges or resentments for I know it gets in the way of my happiness. I meditate on happiness each day which brings more of it into my life. Where my focus goes, energy flows. That is why I choose to only focus on things that are beneficial to my happiness. I enjoy my happiness and never feel guilty about it. I let go of thoughts that don’t serve a purpose in my life or are getting in the way of my happiness. I am guaranteed happiness is I keep searching within for it as what I seek I shall find. No matter what I have done in the past, I still deserve and choose happiness. I am not a reflection of my circumstances, I am a reflection of how I choose to react from the circumstances. I choose reactions that are only beneficial to good health and happiness. I affirm daily that I am happy and getting happier. My goal is to be happy and I remind myself of this fact often throughout the day. I can’t help but meet people who desire for me to be happy. I engage in my passions and purpose in this life for I know it makes me happier when I do so. I engage in self care routines that help me get centered, find peace and regenerate. People are always remarking on how great my energy is and how I radiate happiness and love. If anyone is getting in the way of my happiness in this life, they naturally fall out of my life with ease. I do not tolerate negative people in my life. The only thing I know and seek is happiness and love. Everything else is foreign to me. I have the power to bring more happiness into my life whenever I choose to do so. Happy thoughts pop up into my head naturally and with ease. I enjoy every single moment of the day. I naturally feel light-hearted about things that used to cause me distress. I am the leader of my life, and that makes me feel happy and powerful. No matter how I look or feel, I choose to be happy. I am in a complete state of bliss always and forever. I am not in fear of anything in this life because I have the power of happiness and love to melt away fear whenever I choose. I look at life as a classroom where I am always learning new ways to be happy. I find deep satisfaction in this human experience. The angels are even on my side, supporting me in my pursuit of happiness. I bless the happiness of others for I know what I bless must come back to me. I not only pursue happiness, but I also find abundant amounts of it the more I pursue it. All is well in this world, I feel safe and the feelings of security bring me happiness. My personality traits radiate happiness to the world and this happiness radiates back to me. The more I realize how happy I am, the more I am inspired to pursue it for a lifetime. People will remember me for how happy I was and how happy I made them. I only do things in life that bring me more happiness. I look in the mirror each morning and love myself for I know that when I do so, I feel great about myself and this brings me more happiness. I great big goals for myself for I believe in myself, and through goal achievement I become even happier with myself. I know that it isn’t what I get in life that makes me happy, it is who I become. I choose to see only the positive. I embrace the journey in every way, shape and form. This helps me be much more happy in my life. I love happiness and happiness loves me. I have everything I need right now to be completely happy. I live a life congruent with my morals and values and that makes me feel incredibly great and happy. I wear clothing that makes me feel good in my own skin, hence making me feel much happier. I detoxify my mind and body often as I know my body is my temple and I can’t maximize my happiness if I don’t feel good. I do not stay in any negative state for long. I allow myself to feel it and process is. Then I get back to being happy. I am moving fast along my journey to happiness. Picking up more and more each day. Happiness and being happy feels so naturally and effortless to me. I challenge others beliefs about them not being happy as I know what I allow and justify will come into my life. Therefore I encourage others to be happy. I get lost in the pursuit of happiness and find myself in the process. I love myself when I don’t feel happy. This I have complete control over. And it makes me feel happier. I directly love negative thoughts and feelings. Which makes them dissipate and puts me back into a place of happiness. I feel confident about my abilities and life which makes me feel super happy. I am the master of my fate and I choose a fate of complete happiness in the present and in the future. I look back on the past only to learn from it. Not to beat myself up or stay stuck in the past. This growth helps me become more permanently happy. I smile to strangers on the street and in life because it brings both of us happiness. I am never closed off to opportunities that can make me more happy. I manifest my spiritual connection with ease, allowing me to feel more happy each day. My intuition naturally tells me what I need to do more of to become and stay happy. I am gifted and special and this makes me feel incredibly happy. I feel great pleasure in all that I do in this life. I am delighted to have another opportunity each day to wake up and become more happy. I see amazing opportunities existing all around me and it makes me feel happy. My spirits are always very high. I feel jolly and merry in every single day of my existence. I naturally find myself in deeps states of euphoria and optimism. I find delight in watching others happiness. I perform random acts on kindness on a daily basis which bring me and others happiness. I am merry and exuberant all day long. My dreams show me ways to become more happy and peaceful and I act upon them for I know my higher self is trying to communicate with me. If my path is not bringing me happiness I give myself complete permission to change my path right away. I don’t do things in my life to make others happy, I do things that make me happy. When life hands me lemons, I make lemonade. Feelings of joy well in me unexpectedly. I am constantly finding new activities and things to do that make me feel happy. I know a quiet mind allows me to feel my true nature of happiness. This is why I quiet my mind often through meditation. I do not judge anything that can make me feel more happy and alive and engage in those acts. I work hard and play hard which gives me a great sense of balance and happiness. I know my thoughts reflect my reality, that is why I only think happy thoughts and it shows up in my life. I attract the perfect life partner who is happy with themselves and we make each other happier. My spouse and I are engaged in a pursuit of happiness together that brings us closer and makes such a better relationship. I am the master of my own emotions and therefore I am the master of my own happiness. I know without a shadow of a doubt that I am here to seek and find happiness. I commit to joy and happiness each day. I dream only happy dreams. I don’t judge people or circumstances for it gets in the way of my happiness. I prioritize my happiness over retaliation or trying to win fights. I always ask myself what my outcome is in different situations and scenarios in life and remind myself that is is to be happy. I know nothing can ever be worse than a life lived unhappily, so that is why I choose happiness. I analyze my life very effectively and see the things that aren’t making me happy. And get rid of them right when I see them. My friends always bring me more happiness each time we meet and see each others. I listen to others and ask more questions for I know this brings me happiness, not self-centeredness. I laugh at things that used to cause me distress as I know laughter is a great healer and brings me more happiness. I love that happiness is free to give and free to get. I don’t attach myself to materialistic pursuits for I know that no matter how much I have, it won’t make me happy. I seek to make happy memories instead of spend money on accumulating things. I practice minimilism. I know there is happiness and answers in simplicity, that is why I do not seek to complicate my life. Happiness is a journey, not a destination. Therefore I am always on the journey and never content with my levels of happiness. Negative people do not come into my field of energy as I radiate happiness and joy. I wow at the beauty of life and admire it for all that it is, never taking it for granted. I always feel so fortunate about all the things that I have, knowing there are many with less. This helps me feel grateful and happy. I listen to music and watch TV shows that bring me more happiness, no negativity. My dreams are coming true daily and that makes me so happy. My happiness is contagious making other people happy around me, which makes me even happier. I touch so many lives with my happiness and peace. My future is so bright and that makes me happy. I reflect back often to things that have and are making me happy in my life. I never look to the future with anxiety, only optimism and happiness. Peoples verbal comments never affect my level of happiness, I dictate how I feel about myself. I only align myself with people who value happiness and pursue it as much a I do. I love others all day long which makes me so peaceful and happy. I replace bad habits with good habits that bring me more happiness and success. I choose to feel good wherever I am and whatever is going on. It is natural for me to feel happy. It is easy for me to feel happy all day long. I see situations as they are, not any worse than they are so it doesn’t get in the way of my happiness. I have no need to prove anything to anyone, especially how happy I am. I accept myself completely but am also happy about who I am becoming and eager to grow as a person. I let go of all worry and stress because I know it is getting in the way of my happiness. I grow from my challenges, and when I do my happiness grows to. I get out of my comfort zone often, helping me feel good about having breakthroughs. I know that a mind expanded to different dimensions can never go back to it’s original form. That is why I expand and grow my mind so I can grow my happiness permanently. I share my knowledge about my happiness with others which reinforces my happiness. The teacher learns just as much if not more than the student. I admire happy people and ask them questions about what they do to be so happy. I learn from every single thing in this life which makes me happy. I study happiness like it is a class I need to pass to graduate, hence finding more answers to how I can find complete happiness. I enjoy my life fully and completely. I am thankful that I experience so much happiness in my life. I am proud of how hard I have worked to be as happy a I am. I know I have all that I need right now to feel joy and peace. I live each day as if it is my last, full of happiness and laughter. I don’t take any day for granted for I know they are limited. Even when I have reason to be unhappy, I still choose to be happy and stay happy. The heavens bless me with more and more happiness each day. Happiness and love show up in all of my daily interactions. Everyone loves me and loves to bring me happiness. I build strong relationships grounded in trust, understanding and happiness. I am amazed out how great I feel in my own body and so happy about the direction my life is heading. At any moment I can transcend unwanted feelings and replace them with complete happiness and euphoria. I am inline with natures vibrations which are abundant and peaceful. I bring other people great levels of happiness simply by being around them. I leave the dark night of the soul behind, and emerge as a beautiful and happy phoenix that has risen from the ashes. The truth shall set me free, which the truth is that I am an unlimited being that has an essence based in love and happiness. I believe in myself always and forever. I never worry about using up my happiness or losing it for I know that the supply is never ending. Happy feelings are all that I experience in my daily life. I am happy in the present moment yet still pursue my goals with vigor and confidence. I absorb happiness from other people around me. I radiate happiness like beams off the sun. I am no longer a prisoner of my past. I believe that everything I experience in life leads me to more and more happiness and absolute truth. I accept each moment as I come and never resist change. I see the whole world as being ONE. Hence treating everyone kindly, how I would like to be treated. I love everyone completely and know that we are all in this together. I feel at ease around everybody and enjoy tranquil and happy communication and interactions. I feel pleasure now and always. I grant myself permission to be perfectly and completely happy for all of my days. I am going to make today and the rest of my days the best days of my life. I am living my best life, happy and joyous! So there we are my friend. 201 affirmations on happiness. I truly hope you liked the post and were able to resonate with some of all of the happiness affirmations I shared with you. If you have a chance, share with me what you think your favorites are. As well as if you have any good ones to add that have helped you get through tough times in your life. And bring you towards and/or more happiness.